For educational institutions, a reliable power source is key to a safe and environment. That includes backup generators which, though bulky, are essential in most large organizations, to account for all possibilities. 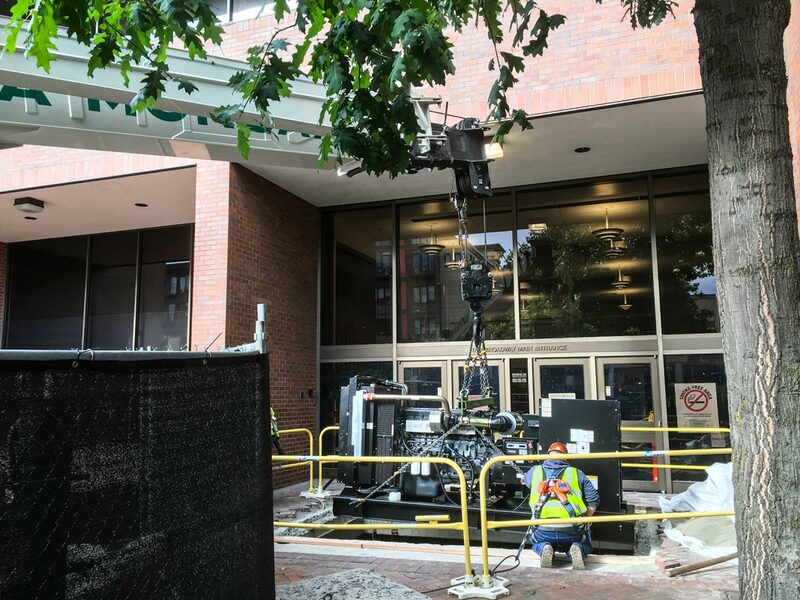 When construction engineering company McKinstry Co., LLC needed help in replacing a backup generator for Seattle Central College, Omega Morgan’s machinery moving guys out of Seattle were up to the task. The job required both thought and planning. Omega Morgan was charged with moving the old CAT generator out of the basement, lifting approximately 10,000 pounds. Then, we had to move a new generator into the same space, taking into consideration a significant weight increase. The new machinery weighed 21,477 pounds. The location of the job made matters even more complex. Seattle Central College is located between Capitol Hill and Squire Park, two of the busiest neighborhoods in the city. Any effort had to account for heavy pedestrian traffic, and required just the right permits to make sure every action was taken within the realms of expectations and legality. Finally, the basement location of the machinery had to be accounted for, especially considering the size of the new generator. The job began with careful planning. Omega Morgan worked with the city of Seattle to secure all necessary permits well ahead of time. 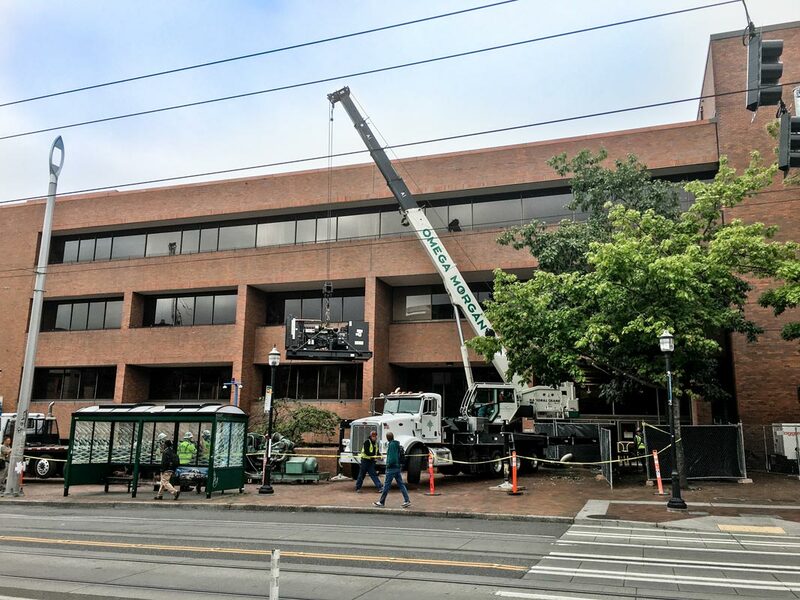 That included street use permission for our 60-ton boom truck, as well as permission for our crane operator and 4-man rigging crew to show up early the day of the job to get a good start. We worked with McKinstry to block pedestrian traffic through barricades to ensure the safety of onlookers and passersby, and got started. First, the crew lifted street panels off the sidewalk and set them aside for easier access. 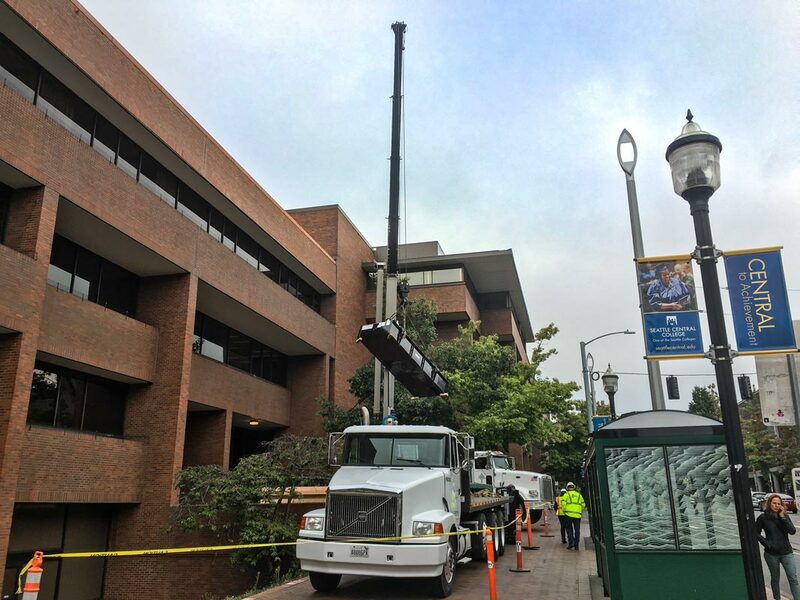 Then, we entered the basement to disconnect the old generator, lift it off the ground, and load it onto our flatbed truck to transport it offsite. 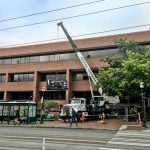 The same truck also delivered the new, larger generator for installation. 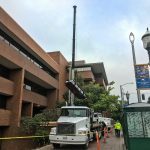 Our 60-ton boom truck was perfect to lift the new generator off the flatbed, and set it into the hole in the sidewalk. 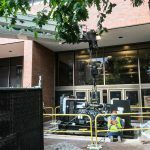 The machinery was too large to fit through the same sidewalk hole in one piece, leading to disassembly into its main parts and a fly or “floating” operation. The individual pieces were still large, so Omega Morgan rigged them to be floated in at an angle designed to fit through the hole and get them below the street surface. During this process, our experience in moving heavy machinery became invaluable. We made sure that the generator would be empty of fuel during the move, the only way to ensure that the necessary floating angle would not damage the machinery. The special rigging designed to get just the right angle was a crucial part of the process. Given its location and the size of the generator, this project was undoubtedly complex. Our experience and expertise in machinery moving ensured full customer satisfaction. Omega Morgan provided McKinstry with a turnkey solution, bringing in and installing the new generator without delaying any other projects or resulting in customer wait time. Hard work paid off, and will continue to pay off for the students and staff of Seattle Central College for years to come. For Omega Morgan, it’s another case study showing how our expertise and experience translates into success for even the most challenging projects in the most difficult environments.